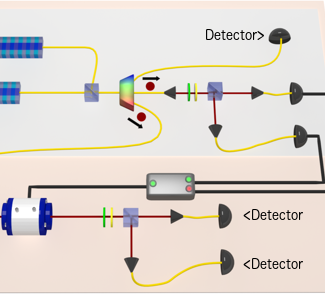 Complex optical photon states with entanglement shared among several modes are critical to improving our fundamental understanding of quantum mechanics and have applications for quantum information processing, imaging, and microscopy. We demonstrate that optical integrated Kerr frequency combs can be used to generate several bi- and multiphoton entangled qubits, with direct applications for quantum communication and computation. 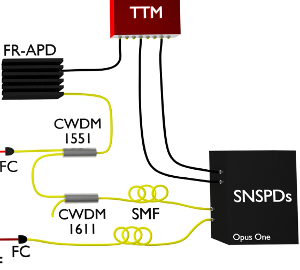 Our method is compatible with contemporary fiber and quantum memory infrastructures and with chip-scale semiconductor technology, enabling compact, low-cost, and scalable implementations. 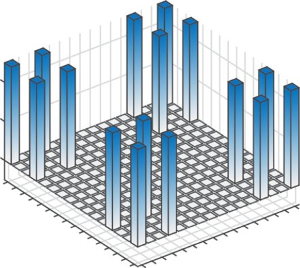 The exploitation of integrated Kerr frequency combs, with their ability to generate multiple, customizable, and complex quantum states, can provide a scalable, practical, and compact platform for quantum technologies. We present an implementation of photonic qubit precertification that performs the delicate task of detecting the presence of a flying photon without destroying its qubit state, allowing loss-sensitive quantum cryptography and tests of nonlocality even over long distance. By splitting an incoming single photon in two via parametric down-conversion, we herald the photon’s arrival from an independent photon source while preserving its quantum information with up to (92.3±0.6)% fidelity. With reduced detector dark counts, precertification will be immediately useful in quantum communication. Efficient sources of many-partite non-classical states are key for the advancement of quantum technologies and for the fundamental testing of quantum mechanics. We demonstrate the generation of time-correlated photon triplets at telecom wavelengths via pulsed cascaded parametric down-conversion in a monolithically integrated source. 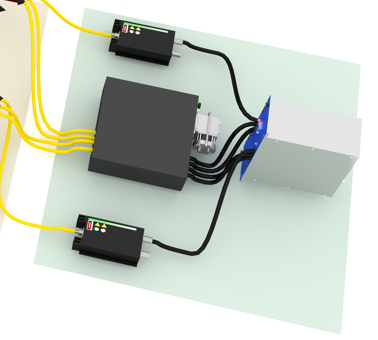 By detecting the generated states with success probabilities of (6.25 ± 1.09) × 10−11 per pump pulse at injected powers as low as 10 μW, we benchmark the efficiency of the complete system and deduce its high potential for scalability. Our source is unprecedentedly long-term stable, it overcomes interface losses intrinsically due to its monolithic architecture, and the photon-triplet states dominate uncorrelated noise significantly. These results mark crucial progress towards the proliferation of robust, scalable, synchronized and miniaturized quantum technology. Multiparticle quantum interference is critical for our understanding and exploitation of quantum information, and for fundamental tests of quantum mechanics. A remarkable example of multi-partite correlations is exhibited by the Greenberger-Horne-Zeilinger (GHZ) state. In a GHZ state, three particles are correlated while no pairwise correlation is found. The manifestation of these strong correlations in an interferometric setting has been studied theoretically since 1990 but no three-photon GHZ interferometer has been realized experimentally. Here we demonstrate three-photon interference that does not originate from two-photon or single photon interference. We observe phase-dependent variation of three-photon coincidences with 90.5 ± 5.0 % visibility in a generalized Franson interferometer using energy-time entangled photon triplets. The demonstration of these strong correlations in an interferometric setting provides new avenues for multiphoton interferometry, fundamental tests of quantum mechanics and quantum information applications in higher dimensions.